After taking the time to properly break in the engine on our new little toy, we were able to have some fun with it and to start learning the different ways to tune it for optimum performance. The first thing we needed to do was to adjust the jetting screws. This truck comes with a high speed adjustment and a low speed or idle adjustment along with a idle speed adjustment. 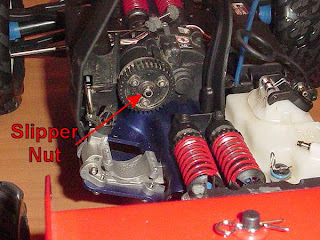 The directions say to tune the high speed first leaning the mixture until no more performance gain is seen, then backing the screw of 1/8 of a turn. After this is done the low speed mixture screw should be adjusted so that when the fuel is shut off to the engine it will take 2 to 3 seconds to die. We got the jetting close and began to play around on some jumps. It was a blast to hit some ramps and practice on the correct way to land. Hitting the brake in the air will pitch the truck forward while staying on the gas will pitch it back. We quickly found how tough this truck is! It can really take a beating. The next thing we wanted to do was to play with the different suspension settings. We installed the long travel rockers and springs that came with the truck and set the preload about halfway. This made the truck sit much higher which made it better suited to take on our little rock garden, but the higher center of gravity made it a bit more tippy. We may stick with the long travel, but back the preload adjustment down a bit to get a lower ride height when it's not needed. The clutch began to slip a little too much when playing around in the rocks, so we tweaked it a bit and found that this can easily and effectively alter the way the truck launches and hooks up. Below are some pics of how this adjustment is done. We started tightening the nut down a quarter turn and probably ended up about 3/4 tighter than it was. The parts on this truck are really top notch, even the clutch pads can be changed very easily along with being able to change the spur gear out for different gearing options. 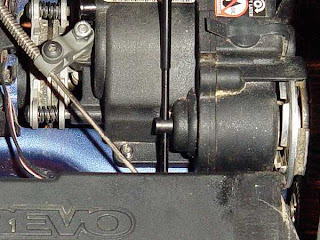 To adjust the clutch, use a small allen wrench or something similar to go through the hole on the backside of the shaft. This will hold the shaft as you use the supplied 8mm wrench to tighten or loosen the nut to achieve the amount of clutch lock-up you want. Don't go to far and risk breaking the pads. The clutch is designed to slip to lessen breakage as well, so keep it loose enough that it will still slip if it needs to. Below are a couple pictures showing the difference in ride height between the stock setup and the long travel rockers and springs. The preload can be adjusted to make it much lower. Video footage I've seen of these racing have them way down to keep the center of gravity down. I'm sure we'll want to lower it when the situation calls for it. Take a gander at this video footage. We've really been spending a lot of time(too much) playing with the truck, but it really is addicting. We've use about half of our $30/gallon nitro fuel, but $15 ain't too bad for the hours we've put into playing with it. When the gas runs low, just put more in. With an electric truck it's either buy a bunch of batteries to keep constantly charging or wait a couple hours between charges. There are pros and cons of each, I think the gas ones are just a blast and fun to work on too. This thing really rips when everything gets adjusted right. Enjoy the video! This is a cool site. I just found it today. Keep up the good work. wow you did lot of fun with it. You have taken nice video.